Nerines, commonly known as Cape flowers, are a genus of bulb plants that belong to the Amaryllidaceae family, native to South Africa and now widely grown and hybridised worldwide. It is an adaptable plant, blooming from mid to late summer to early winter, when most other bulbs are dormant. They are a useful cut flower, remaining fresh for a long time. In colder climates, they must be grown under glass but should do well in the southern and sheltered parts of the UK. The plant produces a few narrow leaves in late winter and spring which die down, the bulb remaining dormant until autumn, when it sends up a single stem about 30 cm high bearing a cluster of pink, funnel-shaped flowers about 4cm in diameter. 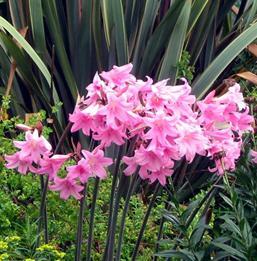 Nerines can be grown in containers or any free-draining soil, in sun or light shade. Water when growth takes place, only a little is required through the dormant period. Nerine bowdenii is the hardiest species, tolerating heavy frosts. Other species are rather frost tender and summer dormant. Plant the bulbs in autumn to early winter, 6cm deep and 7-10cm apart and cover with a mulch as frost protection. Do not disturb them, allow them to grow in a mass. Divide the bulbs every four or five years, when they become overcrowded, replant in containers or open ground. They can also be propagated by scaling. Nerines produce fleshy seeds which are ready to germinate immediately and should be pushed into a well drained mix and watered from the bottom by capillary action. Nerines are susceptible to mealy bugs and bulb flies. Treat with a systemic insecticide. Grow in free draining soil, sunny or partial shade. Mealy bug and bulb flies.